Background: Denture polymers may be strengthened by modifications of material itself, or by incorporating various reinforcements into the polymer material that enhance the flexural strength. Objectives: To evaluate and compare the flexural strength and fracture toughness of heat activated PMMA resin and heat activated PMMA resin reinforced with E glass fibers. Materials and Methods: A total of 40 specimens were prepared according to the ISO specification (65 × 10 × 3 mm), 20 specimens were reinforced with E glass fibers considered as test samples. They were stored in distilled water bath at 37°C for 48 hours before testing. The flexural strength and the fracture toughness were evaluated using universal testing machine at a cross-head speed of 1 mm/min. Results: Data were analyzed using one sample Kolmogorov-Smirnoff test (Normality test) and t test for the flexural strength and fracture toughness. Conclusion: The flexural strength of heat activated PMMA resin reinforced with E–glass fibers were statistically significant compared to the control group. Subsequently physical and mechanical properties of acrylic dentures were enhanced by integration of different fibers like graphite, glass and organic fibers such as aramide and polyethylene fibers. In the past 30 years, fiber reinforcements mostly made of polyethylene,  carbon-graphite,  or glass  were used to obtain materials with improved mechanical properties not only in polymeric dental materials, but also in aeronautical, civil, and automotive industry. In recent years, the most commonly used fibers in dentistry are the E glass fibers, because of their acceptable esthetics and good bonding with dental polymers. Hence this study was done to evaluate and compare the flexural strength and fracture toughness of heat activated poly methylmethacrylate and heat activated Poly methylmethacrylate reinforced with E glass fibers. A hypothesis was formulated that the flexural strength and fracture toughness will be the same after E-glass fiber reinforcement. To evaluate the flexural strength and fracture toughness of heat activated resin, a master die was prepared according to ISO 1567 with the dimensions of 3.0 mm width × 10 mm thickness × 65.0 mm length. Polyvinylsiloxane putty (Aquasil, Dentsply, India) was used as duplicating material to create a mould space for fabrication of wax patterns. The wax patterns were duplicated from a special metal mold then invested into metal flasks using type III dental stone (Begostone; Bego, Bremen, Germany. A total of 40 samples were prepared in which 20 samples were prepared in conventional PMMA resin (Meliodent, Bayer Dental, Germany) and the other 20 specimens prepared with the same PMMA reinforced with E glass fibers. Strips from the un-impregnated fiber reinforcements were cut (55 mm of length, 5 mm of width) and a coating of 3 Methacryloxy propyltrimethoxy silane (CAS NO 2550-85-0, Nanjing Capatue Co ltd, China ) was applied on the E-glass fibers and dried for 15 sec then mixed with the PMMA resin. Control group specimens were prepared in powder/liquid (P/L) ratio of 10 ml/23.4 g according to the manufacturer’s recommendations. The glass fibres were soaked in monomerpolymer mixture (10 ml/8g ratio) for 10 minutes to ensure better impregnation of E-glass fibres into PMMA material. All reinforcing fibers were oriented in the long axis of the specimens. The heat polymerization was performed by immersing the flasks in 65°C water for 90 minutes, followed by another immersion in 100°C water for 30 minutes. The processed samples were stored in distilled water at 37°C for 28 days before testing. The samples for flexural strength test were grouped as Group A (control), Group A1 (reinforced with E glass fibers). The samples for fracture toughness were grouped as Group B (Control), Group B1 (reinforced with E glass fibers). To evaluate the flexural strength of all samples, they were subjected to a threepoint bending test in a universal testing machine. (Autograph universal testing machine, Shimadzu corp, Japan). The flexural strength was calculated using the formula M = 3WI/2bd2 (M - flexural strength (MPa), W - fracture load (N), I - test span distance between support points (mm), b - width of specimen (mm), d- thickness of specimen (mm). The fracture toughness of the samples was evaluated with the indentation strength method and was subjected to a threepoint bending test in a universal testing machine (Autograph universal testing machine, Shimadzu corp, Japan). The values were calculated using the following formula KIC=0.59 (E/H) 1/8 (SfP 1/3) ¾ where 0.59 is a geometrical constant, E is the Young’s modulus, H is the hardness, Sf is the stress at fracture, P is the indentation load. With this method a stable crack was generated with a Vickers indenter and the residual strength was measured with a conventional three point bending test. The mean flexural strength and fracture toughness values of each group were calculated and the data were analyzed statistically using one sample kolmogorov-smirnoff test (Normality test) and t test. Then the samples were analyzed under Scanning Electron Microscope (phenomPro X, Phenom-World BV, The Netherlands) for the surface topography [Figures 1 and 2]. 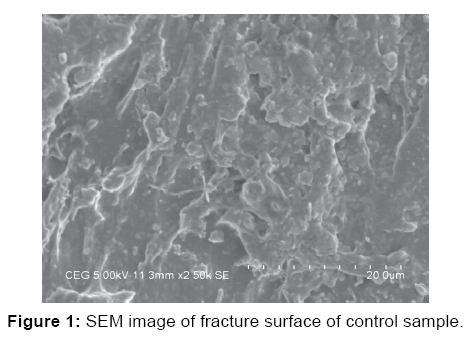 Figure 1: SEM image of fracture surface of control sample. 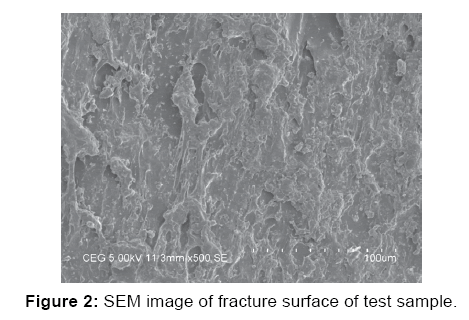 Figure 2: SEM image of fracture surface of test sample. To analyze the data software SPSS version 22.0 Armonk, NY: IBM Corp. was used and power analysis was done with confidence interval of 95%. (α-0.05). The values were statistically analyzed using one sample Kolmogorov-Smirnoff test (Normality test) and the results showed that the variables of flexural strength and fracture toughness follow normal distribution. Therefore to analyze the data, parametric tests were applied. To compare the mean values between the two groups independent samples t-test is applied. The mean flexural strength value of the control group (Group A) is 58.59 Mpa and the mean flexural strength value of the E- glass fibers reinforced heat activated PMMA (Group A1) was 91.14 Mpa. The values were statistically analyzed using independent samples T-test which showed the significant value P 0.003, which is less than 0.05. Hence it is statistically significant [Table 1]. The mean fracture toughness value of the control group (Group B) was 1.2780 Mpa√m½ and the mean fracture toughness value of the E-glass fibers reinforced heat activated PMMA (Group B1) was 1.7320 Mpa√m½. The values were statistically analyzed using independent samples T-test which shows the significant value P<0.001, which is less than 0.05. Hence it is statistically significant [Table 2]. Table 1: Independent samples T-Test to compare mean flexural strength between groups. Table 2: Independent samples T-Test to compare mean fracture toughness between groups. The comparison of mean flexural strength of heat activated PMMA resin and E-glass fiber reinforced PMMA resin was more than the heat activated PMMA resin [Figure 3] and the mean fracture toughness of heat activated PMMA resin and E-glass fiber reinforced heat activated PMMA resin was greater than the heat activated PMMA resin [Figure 4]. 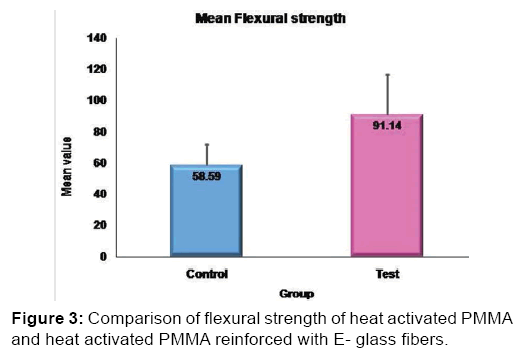 Figure 3: Comparison of flexural strength of heat activated PMMA and heat activated PMMA reinforced with E- glass fibers. 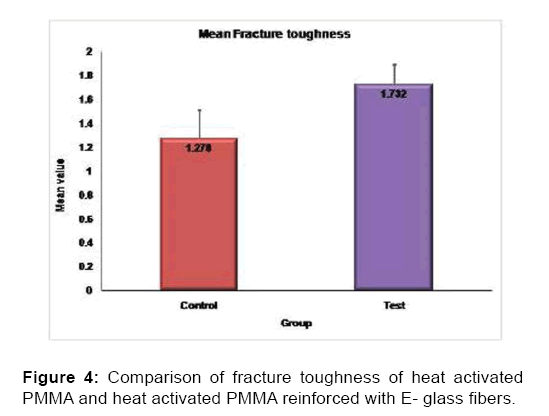 Figure 4: Comparison of fracture toughness of heat activated PMMA and heat activated PMMA reinforced with E- glass fibers. In the past 30 years, fiber reinforcements of PMMA resin was done using polyethylene, carbon-graphite, or glass to obtain materials with improved mechanical properties not only in polymeric dental materials, but also aeronautical, civil, and automotive industry. However, good bonding between the reinforcement and the acrylic resin is crucial for a significant stiffening effect. Thus, the inability to adequately impregnate the fibers in the polymer and monomer mixtures of high viscosity, such as PMMA, represents a significant disadvantage for the use of fibers as reinforcement materials for dentures. The results of the previous studies 2, [9-11] showed that the flexural strength of heat activated PMMA resin reinforced with glass fibers more than the flexural strength of heat activated PMMA reinforced with aramid and polyethylene fibers. The carbon fibers showed the highest flexural strength when compared to the other reinforced fibers. The carbon, aramid and polyethylene fibers when they were used as reinforcement material for denture base. They showed difficulty in polishing and also they were not esthetically pleasing. To overcome that, E glass fibers were preferred as the reinforcing material and it also it improved the mechanical properties of the denture base. So, E-glass fibers have been used in this study. Hence this studies rejecting the null hypothesis. This study compared the flexural strength and fracture toughness of heat activated acrylic resin and heat activated acrylic resin reinforced with E-glass fibers. The mean value of flexural strength and fracture toughness of heat activated PMMA resin with E-glass fibers were 91.14 Mpa and 91.14 Mpa. On statistical analysis the significant value P=0.003, which is less than 0.05. Hence it is statistically significant compared to heat activated PMMA resin. The scanning electron microscope image analysis of specimens reinforced with E- glass fibers showed existence of voids between E glass fibers and polymer revealing partial bonding between glass fibers and polymer material. The distribution of E-glass fibers and the bonding of the E-glass fibers with the heat activated PMMA is unpredictable. Also the study was done under laboratory conditions, the samples prepared in this study were not of denture base configuration. The PMMA denture base reinforced with E- glass fibers showed an improved flexural strength and fracture toughness. Hence it can be used as a reinforcement material to prolong the life span of the denture clinically. The mean flexural strength of E-glass fibers reinforced heat activated PMMA was 91.14 Mpa and the mean fracture toughness value of the E-glass fibers reinforced heat activated PMMA. The flexural strength and fracture toughness of heat	activated PMMA resin reinforced with E- glass fibers was statistically significant when compared to the conventional PMMA resin. I declare there is no conflict of interest. Polyzois GL, Andreooulos AG, Langouvardos PE. Acrylic resin denture repair with adhesive resin and metal wires: effects on strength parameters. J Prosthet Dent 1996;75:381-387. Stipho HD. Effect of glass fiber reinforcement on some mechanical properties of autopolymerizing polymethyl methacrylate. J Prosthet Dent 1998;79:580-584. Carroll CE, Von Fraunhofer JA. Wire reinforcement of acrylic resin prostheses. Journal of Prosthetic Dentistry 1984;52:639-641. Ruffino AR. Effect of steel straighteners on fracture resistance of the acrylic resin complete denture base. Journal of Prosthetic Dentistry 1985;54:75-78. Smith DC. Recent developments and prospects in dental polymers. J Prosthet Dent 1962;12:1066-1078. Stafford GD, Smith DC. Flexural fatigue tests of some denture base polymers. British Dental Journal 1970;128:442-445. Beyli MS, Von Fraunhofer JA. An analysis of causes of fracture of acrylic resin dentures. J Prosthet Dent 1981;46:238-241. Kanie T, Fujii K, Arikawa H, Inoue K. Flexural properties and impact strength of denture base polymer reinforced with woven glass fibers. Dental Materials 2000;16:150-158. Alla RK. Influence of fiber reinforcement on the properties of denture base resins. Journal of Biomaterials and Nanobiotechnology, 2013;4:91-97. Vojvodic D, Komar D, Schauperl Z, Čelebić A, Mehulić K, Žabarović D. Influence of different glass fiber reinforcements on denture base polymer strength. Medical Glass 2009; 6:227-234. Kamble VD, Parkhedkar RD. In vitro comparative evaluation of the effect of two fiber reinforcement on fracture toughness of provisional restorative resins. 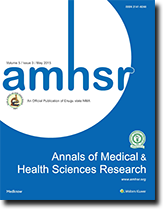 Journal of Dental Research 2012; 23:140-144. Kamble VD, Parkhedkar RD, Mowade TK. The effect of different fiber reinforcements on flexural strength of provisional restorative resins: An in-vitro study. Journal of Advanced Prosthodontics 2012;4:1-6. Zhan M, Matinlinna JP. E-glass fiber reinforced composites in dental applications. Silicon 2012;4:73-78. Sung HK, David CW. The effect of reinforcement with woven E-glass fibers on the impact strength of complete dentures fabricated with high-impact acrylic resin. J Prosthet Dent 2004;91:274-280. Mathew M, Shenoy K, Ravishankar KS. Impact strength of e-glass reinforced PMMA. Prosthesis Journal of Evolution of Medical and Dental Sciences 2013;2:5971-5979. Ladha K, Shah D. An in-vitro evaluation of the flexural strength of heat-polymerized poly methyl methacrylate denture resin reinforced with fibers. J Indian Prosthodont Soc 2011;11:215-220. Yu SH, Cho HW, Oh S, Bae JM. Effects of glass fiber mesh with different fiber content and structures on the compressive properties of complete dentures. J Prosthet Dent 2015;113:636-644.